A critical need in the Great South Bay study is the ability to continuously monitor changes in major chemical, biological and physical parameters in order to guide and validate model developments. Temperature, salinity, and meteorological forcing are particularly important to further develop the circulation model and lower trophic level models. 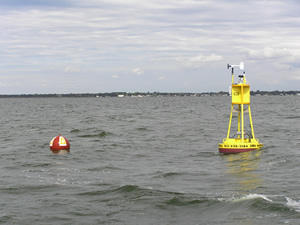 To fulfill this need, data are being collected from eight stations on the Great South Bay using SeaCat instruments measuring temperature and salinity. The stations include, from east to west on the north shore: Smith Point, Carmans River, Bellport, Blue Point, Islip, Tanner Park, the US Coast Guard Station, and Barrett Beach on Fire Island. The instruments are deployed for as much as three months at a time, less in the summer due to heavy biofouling. In addition to the delayed-mode SeaCat data, meteorological data are being collected from the south tower of the Smith Point bridge. 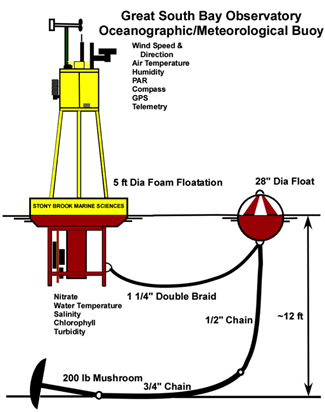 Those data include temperature and salinity from the Smith Point SeaCat, short and long wave radiation from Eppley pyronometers, and wind speed, wind direction, air temperature, humidity, barometric pressure and rainfall rate from a Vaisala WXT520.